Think making a homemade pea soup recipe takes too much effort? Especially during a weeknight when you’re too busy to cook? It’s much simpler than you think! 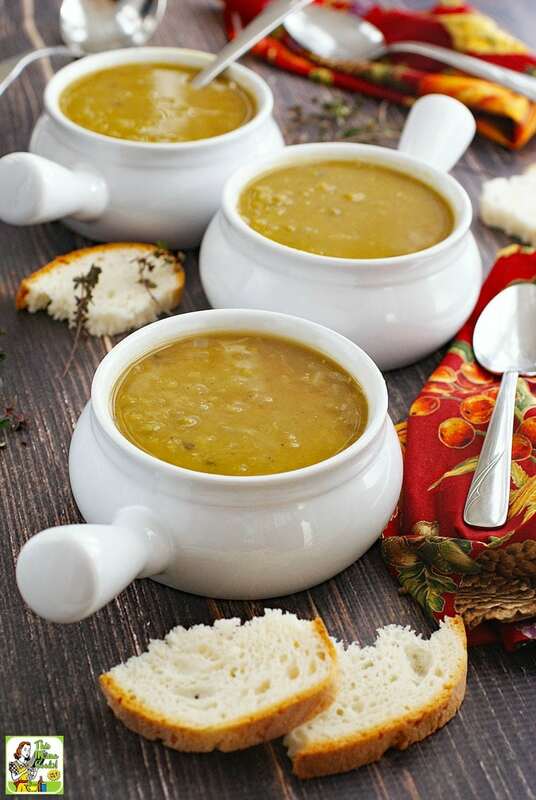 A batch of this Best Split Pea Soup recipe for a busy weeknight takes about 60 minutes. Most of that is simmer time, when you can be doing other things like cleaning up and setting the table with cute handled soup bowls. Plus, the taste of this green pea soup is so worth it, especially compared to canned soup, which can be full of sodium and other ingredients you may not want. Making the best split pea soup recipe ever! 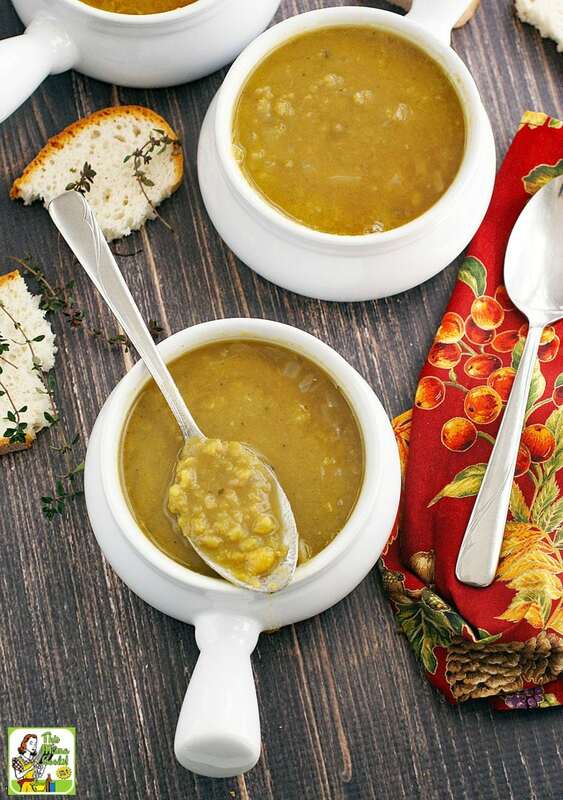 This split pea soup recipe came from a food blogger recipe challenge when I was assigned Grandma Loy’s Warming Split Pea Soup. 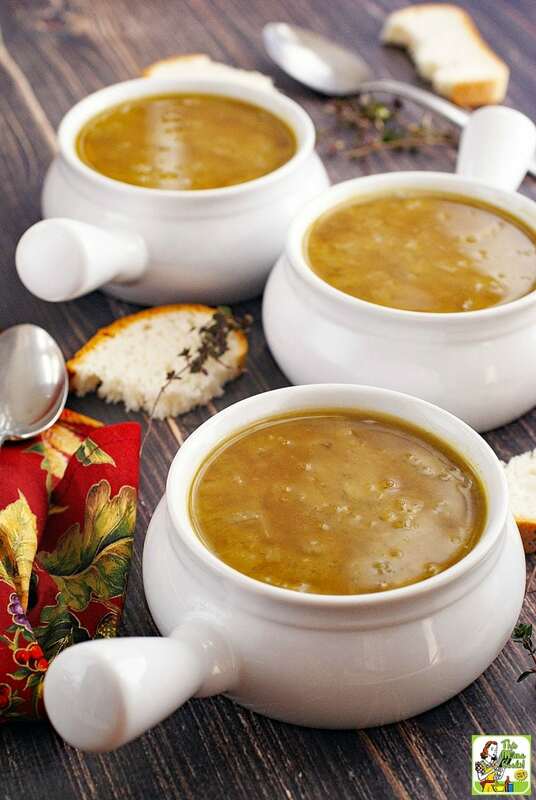 She based her easy recipe for split pea soup on one she found in Women’s Day magazine. I changed up a few of the split pea soup ingredients used by Grandma Loy. First, I used homemade stock (and no additional water) and didn’t use bouillon cubes and water. If you’re vegetarian or vegan, you can use a vegetable stock. Otherwise, store bought chicken stock will work. If you’re gluten free, check the label to make sure the stock you buy is gluten free. I also sautéed and caramelized the onions to soften them up and add a little unique flavor for the best Split Pea Soup recipe! If you have ham on hand, you can turn this into a ham and pea soup recipe. It’s a great way to use up leftover spiral cut ham during the Easter, Thanksgiving or Christmas holidays. For a smooth soup, run the pea soup recipe through a high speed blender, a food processor, or use a hand blender directly in the 4-quart pot. Using a hand immersion blender is the easiest way to puree the green pea soup since you don’t have to transfer the soup to the blender and then back into the pot. If you don’t have an immersion blender, treat yourself to one! 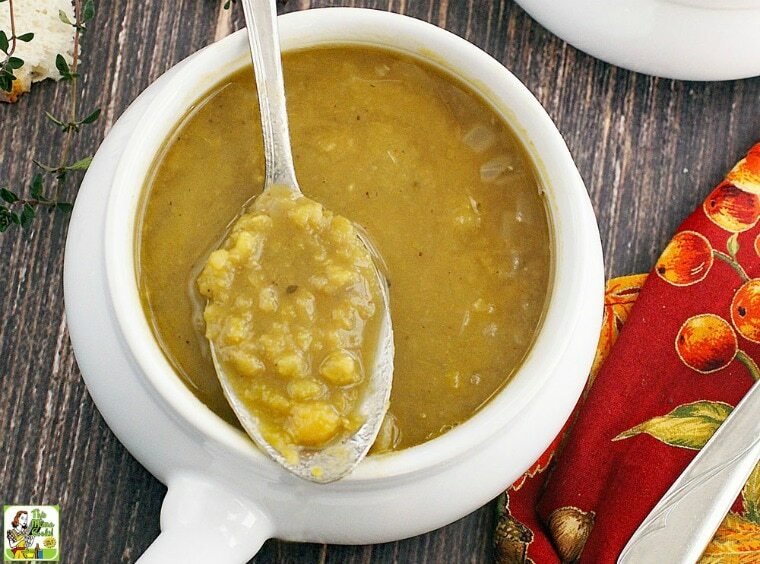 You may want to make a double batch of the Best Split Pea Soup. Freeze in food storage containers to heat up on a busy weeknight. Grandma Loy used bullion cubes for her split pea soup recipe as a thrifty shortcut. I used homemade stock made in my slow cooker, which I find is even thriftier! 1. After roasting a turkey, chicken, ham, or a pig (which we occasionally do at our backyard barbecues), take the carcass or bones and place them in your slow cooker. Cover with water. 2. Add some herbs to the water – thyme, oregano, sage, rosemary, etc. Dried or fresh will work. 3. Add some crushed garlic cloves. Cut up an onion, a couple of carrots, parsnips, and some stocks of celery (whatever you have on hand), and add them all to the slow cooker. 4. Cover and cook on low overnight or for 8 to 10 hours. 5. Remove large pieces of bones and vegetables from the slow cooker and strain the liquid into food storage containers. Label with date and type of stock (turkey, chicken, etc.). 6. If you want, you can pour stock into a couple of ice cube trays. Freeze and store cubes in freezer bags to use when you just need a little stock in your cooking. Looking for more soups for a busy weeknight? Try this Kale Soup Recipe, this 30-minute Pozole Recipe, or Easy Tomato & Okra Soup. Pour peas on to a plate to check that there are no rocks or other foreign objects in with the peas. Heat olive oil in a 4-quart pot over medium high heat. Add onions, minced garlic, thyme, pepper and salt. Stirring frequently, sauté until onions soften, start to brown and caramelize. Add stock and peas. Bring to a boil, reduce heat to low, cover and simmer 60 minutes or until peas are soft. Stir occasionally. You can puree the soup in a blender, a food processor, or with a wand blender if you wish. Serve with gluten free bread and a nice side salad. Originally posted on February 9, 2015 and January 30, 2017. Updated with new pictures and information. Posted in Crock Pot and Slow Cooker, Gluten Free, Recipes, Soups, Veggies and tagged vegan, vegetarian on November 19, 2018 by Anne-Marie Nichols. How to Make the Easiest Spinach Artichoke Dip Ever! I love Split Pea Soup and have not made it yet this winter. You are inspiring me. I made scratch ham stock for the first time after Easter two years ago and it’s the God’s Nectar as far as I’m concerned! The advantage of having the yearly pig roast is having the leftover bones to make stock from! It’s such a big animal that I have to freeze the bones and make the stock in batches. Inevitably, I find another bag of bones under a pile of frozen cheese or bread. 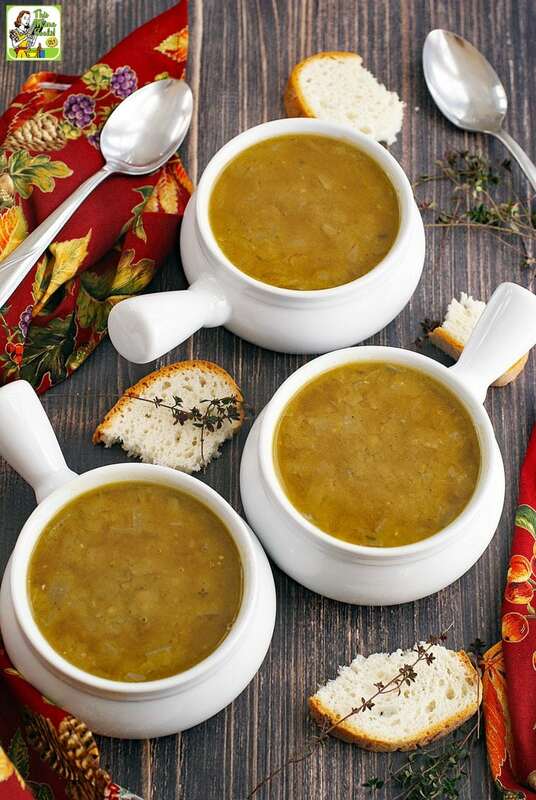 I love Split Pea Soup and this is a great pick for the SRC! I’m tempted to make it again soon since this weekend it’s going to be cold in Georgia. Thanks for stopping by Miz Helen! It’s definitely soup weather here in New England and this would be great to warm up with. And thanks for the stock tutorial! You’re so welcome. Making stock this way has been a revelation! Your pictures are beautiful! And what a comforting SRC choice! I love split pea soup. Thanks for the reminder. I really need to make this more often. It was soooo gooooood. I am so glad that you and your hubby liked the soup. It is one of our favorites, and I make it often. I actually do keep homemade chicken broth in the freezer more now than when I posted the recipe. It is great that you included the directions to make it. Recently when I make this soup, I include some diced red pepper along with the carrot which makes are really pretty dish. I love your soup bowls, by the way. So cute. Will miss you in Secret Recipe Club, but I keep up with your posts via email. Have a great week. Thanks so much, Loy. It was a great recipe to leave SRC with. So glad I found it! Such great comfort food this is. Beautiful presentation. That looks SO comforting and cozy. I adore split pea and ham soup but have never made it at home before. So easy, there’s really no excuse not to! I love split pea soup! Your changes kick it up to the next level. Sorry to read that you are leaving the group. It has been nice cooking with you.